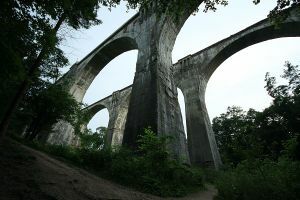 Railway viaducts at Stańczyki, Masuria, constructed 1912-1914 (nothern one) and 1923-1926 (southern one). Warmia-Masuria (Polish: Warmińsko-Mazurskie) is a north-eastern region in Poland. 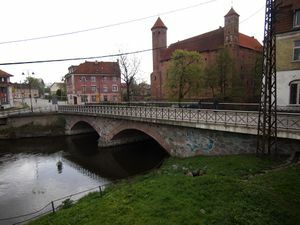 Lidzbark Warmiński, a historical capital of Warmia. Masuria (Mazury in Polish, and Masuren in German) is a lake district. It has over three thousand lakes, the most in the Great Masurian Lakes area. Many of them are connected by channels and rivers, so it is possible to sail hundreds of kilometers from Wegorzewo to Pisz. Masuria and the Mazury Lakes are easily accessible with the numerous roads. Note that the roads are narrow, unlit and sometimes unmarked. There is also a chance for potholes. Gizycko has a train station with bi-hourly connecting trains to Warsaw and Gdansk. Note that trips from Warsaw take a very, very long time (6 hours or more) because of the lack of North-South rail connections in Poland, therefore the train takes very many detours rather than a direct route. There is an airport at Olsztyn with flights to London with Ryanair. The nearest Airports are Warsaw's Frederic Chopin Airport (WAW), Gdańsk's Lech Wałęsa Airport (GDN), and Bydgoszcz's Ignacy Jan Paderewski Airport (BZG). The Wolfs Lair (Wilczy Szaniec) (former Nazi HQ where Hitler resided during most of WW 2) is quite close to the Mazury lakes, just east of the town of Kętrzyn (Rastenburg). It is easily accessible by car by driving over a narrow but very new paved road. You will see large signs on major roads indicating the directions to the hidden bunkers. Sztynort is a small town next to the Mazury Lakes, where you can see an old German style Mansion/Castle. Masurian Landscape Park (Mazurski Park Krajobrazowy) - established in 1977 expecting to convert it to the National park. Covers the most scenic Masurian landscape around the Lake Śniardwy, the largest lake in Poland. HQ located in a wooden historical bulding, address Krutyń village 66, 11-710 Piecki, Mrągowo county ☎ +48 89 742-1405 (fax: +48 89 742-1405). Sailing is cheap and very popular, both young and old. Take a friend with you that can speak Polish however, so you won't get scammed and get the boat you want for the right price. Generally, sailing boats (i.e. for 6 passengers) are rented out by small companies or individuals, and they do not speak English very well, if at all. Gizycko has one of the biggest harbors in the area and is one of your best bets to get a sailing boat. Ice sailing is a popular sport in winter, when the Mazury lakes freeze up. Fishing is also quite popular here. You will see a lot of smoked fish stalls all around the area, and even on the lakes on small 'vending boats'. Tourists do not need a permit for recreational fishing, for sport fishing, a permit is required which you can get at all major harbors. Masurian Community Of Tourism and Sightseeing (Oddział Warmińsko-Mazurski Polskiego Towarzystwa Turystyczno-Krajoznawczego), Staromiejska St 1/13, Olsztyn 10-950 (near the bus station Wysoka Brama), ☎ +48 89 527-3665 ([email protected], fax: +48 89 527-3665). M-Th 12:00-16:00, Fr 11:00-14:00. Offers guide service, assistance in organizing hikes, bicycle and kayak trips. Kayaks for rent. Always lock your sailing boat and stash away valuables in non-obvious places. Even if the site where you are camping seems desolate; there are always people around. The Mazury Lakes has a warning system with a flashing light and audio signal on top of high towers on the banks of the lakes. If these lights start flashing, it could mean that a storm is approaching. Even if the sky seems clear, such storms could appear out of nowhere. Such a storm has caused sailing boats to capsize and fatalities have occurred in the past. In case you see such a warning signal, land is your best bet. as well as Russia and the Baltic Sea. This page was last edited on 24 June 2017, at 08:18.